For me, inspiration often comes through journaling. The freedom that is found within the safe covers of my art journal allows me to explore my feelings and convey them visually. Most often the words come to me last. I either make them up or find the perfect quote, but it is almost always at the end of my creative process. This is part of what I have learned about myself through journaling. It is as if I pour out the feelings and then can put words to what those feelings are. This weeks challenge prompt at Melange is ‘Inspiration’. 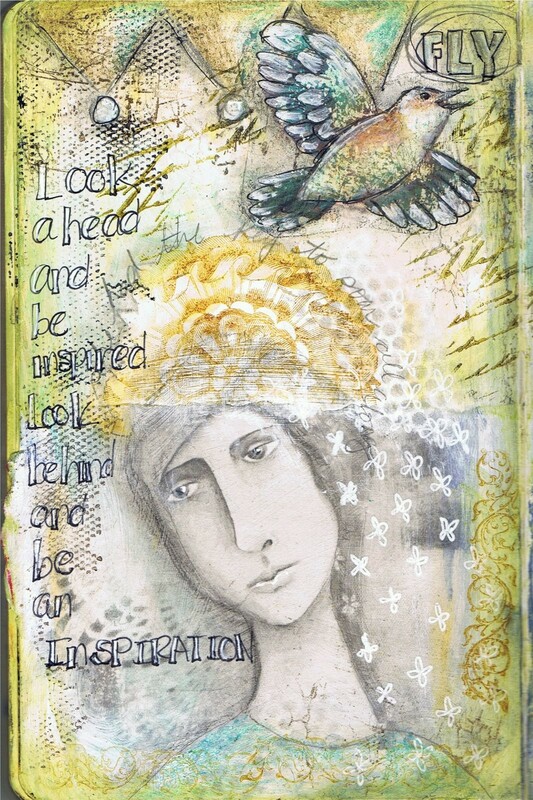 The words on this journal page came to me at the end of the process. Art is a journey. A discovery of your creative nature. We are inspired by others who have gone before us, and inspire others to follow along. Each of us is in that place. Every time we create we are inspired by something and our work inspires someone or something else. Wow Pam.. great art, awesome quote! Another piece of beautiful work! Very poignant thoughts on a magnificent journal page. I love your style, Pam!